Tony De King’s international background includes the club and cabaret circuit throughout the United Kingdom, where Tony De King was selected to represent the elite “Combined Services Entertainment” company entertaining the British Forces worldwide. Tony De King then spent two years on tour in the United States of America working with many famous artistes including Frank Sinatra, Willie Nelson, Jerry Lewis (his last appearance in Las Vegas) and Rick Springfield. Tony De King’s most outstanding attribute is Tony De King's flexibility and versatility having performed at many corporate functions consisting of a diversity of language groups and cultures. Tony De King has accomplished an extremely good reputation for Tony De King's performances in many different casinos throughout the country, including Joe Parker’s Comedy and Jive Nightclub in Monte Casino and also Comedy Express at Carnival City. Tony De King is also involved with many theatre type venues such as the Barnyard Theatres. Tony De King is also very well known in the Golfing Fraternity where Tony De King has performed at most of the Gauteng Golf Clubs entertaining for Captain’s Dinners, Golf Tournaments, Awards Evenings etc. Tony De King has also been involved with many national promotions and launches for various leading corporations. Tony De King also comes highly recommended as a Master of Ceremonies for any type of function including hosting of presentations or Awards evenings. 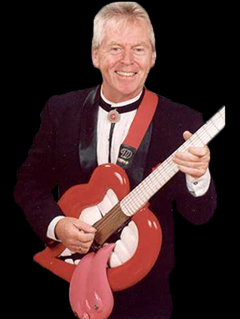 Tony De King's show is completely adaptable as Tony De King is not only a stand-up comedian but also a very talented singer and guitarist. Tony De King’s musical repertoire is vast, spanning from the rock ‘n roll of the fifties and sixties, to heavy rock, to country to swing right through to modern day commercial songs. Tony De King can also play mariachi style music as Tony De King is a very versatile entertainer. Tony De King is a born entertainer and Tony De King loves to perform on stage and for Tony De King's corporate clientele. Whatever the type of audience, whatever age group they may be, Tony De King will ensure an excellent evening’s entertainment.